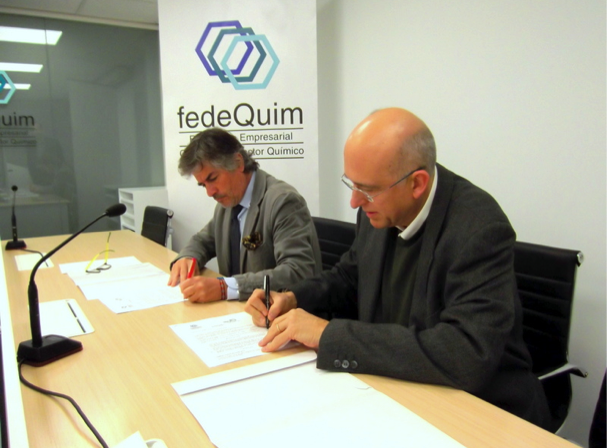 Within the framework of the Mobile World Congress, the Catalan Business Federation of the Chemical Industry (FedeQuim) and the consultancy Idees2Value Network have signed a collaboration agreement to provide advice to Catalan chemical companies about the development of Industry 4.0 in their activities. In addition, the access to a scholarship of students of the technical disciplines related to the Industry 4.0 will be facilitated so that they can help to his management and implementation in the companies. FedeQuim is the Catalan Business Association of the Chemical Industry that has partners with 180 companies and 6 sectorial or territorial Associations. It is associated with FEIQUE and Foment, and its main mission is to defend the interests of companies in the sector, as well as to facilitate the necessary instruments for the improvement of their competitiveness through the adaptation to the constant legislation as well as the permanent training of its collaborators. The Catalan chemical industry is a sector composed of more than 1,100 companies, with an annual turnover of 25,000 million euros, which represents 43% of the total of Spain, which generates 18% of industrial GDP in Catalonia with 163,200 direct, indirect and induced jobs. One of the core programs developed by Idees2Value is industry 4.0, facilitating a transversal and integrating approach to the process of transformation of industrial companies.